We have just found out that mars is habitable so you will now proceed into building our base on the surface of it. You will start off this strategy game a little easy till you can get familiarized with the controls, but when you think that things will go smooth for you, the aliens will start attacking so you need to build some barracks and hopefully fight them off until they will leave us alone. 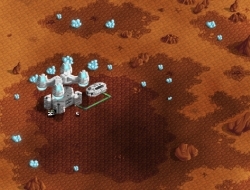 Build all sorts of units and buildings that will farm the underground of the planet, giving you the resources needed for you to continue building. Mars Colonies 5.33 between 0 and 10 based on 3 votes.